When the clock strikes twelve this Thursday, the days that filled 2015, break into fine particles that fill the inside of an internal Etch-A-Sketch. And then we shake it clean. Wipe it out. Now, we get to turn the knobs and design 2016. We have 365 days to thrive or screw it up. Usually both. But that's okay because in reality, New Years Day is nothing more than one big do-over. It's a day when we come to the realization that over the holidays (which started in November), we ate too much, we drank too much, we spent too much, we slept too little. In short, we are exhausted, broke, hungover and fat. Happy New Years. And, to the select lucky people like me, it's also Happy Birthday! 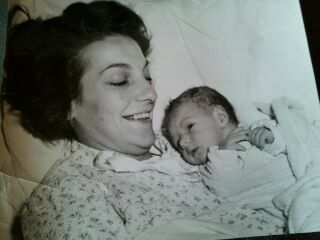 Many years ago, way before the force was with us, I was born at three minutes after midnight on January 1. Since I was the first born in the county, prizes were awarded, newspapers gathered and a celebrity was born...although my 15 minutes ended on January 2. And, since those three minutes cost my father a tax deduction from the previous year, he reminded me annually that I owed him $550. Holidays and birthdays. Oil and water. Spanx and big thighs. Actually, I don't believe that all birthdays on a holiday are difficult. I think it would be really cool to blow out birthday candles on the Fourth of July when parades and fireworks are happening all over the country. Even Easter wouldn't be bad when we celebrate the resurrection of our Lord with dyed eggs and chocolate bunnies. But New Year's Day has a weight to it that is sometimes hard to carry into the new year. There is also the issues of a birthday gift seven days after the biggest gift giving day of the year! On our first year as a married couple, my then husband made the mistake of pointing to the pile under the tree on Christmas Eve and saying "pick which one you want to be your birthday present and I will put it away till next week." That only happened once. But the truth is, by this time of year, most people have empty pockets and smoking credit cards, and the thought of purchasing one more gift can be a little over whelming. At least I feel that way. Even today, I feel bad-actually guilty- that my kids have to buy one more gift after the generous Christmas Eve swap. It is more than enough for me that my sister cooks a lovely New Year's Day/Birthday dinner and my sons and "daughters" will gather around the table to celebrate. 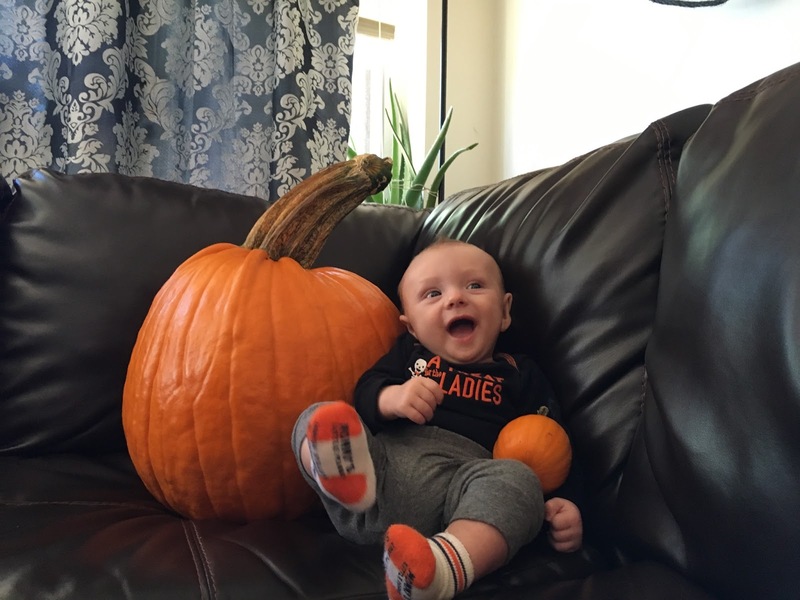 Especially this year, with my favorite leftover from 2015, my grandson Lucas! He makes everyday a reason to celebrate! On January 1, my birthday, I will take down the tree and all the decorations. After the month long glow of white lights and favorite ornaments, baking, cooking and large gatherings, the house will seem stark for a while. The holidays are officially over and a new year begins. But it's all good. As you get older, even if it is on a holiday, each birthday is appreciated. Each new year is a gift in itself! I actually look forward to 2016! After bouncing around in the beginning of 2015, I found a job that excites me. One I look forward to growing with this coming year. Along with an Autumn wedding and the continual daily wonder of Lucas, this new year holds promise. So, on the eve of a brand new year, and with the approach of another birthday, I will celebrate by having an early dinner with friends, raise my glass to 2016, and slip into bed...by 10:00. I've been here before. I fall asleep confident that the ball will drop. And as long as it's not on my head, I don't need to see it. Last night, one full week before Christmas, I waited in front of the local mall for traffic to move. Traffic light, after light, I was inching my way up the road mumbling words that didn't really fit with the Christmas Carols playing on the radio. And the frustration was this, I wasn't even going to the mall. 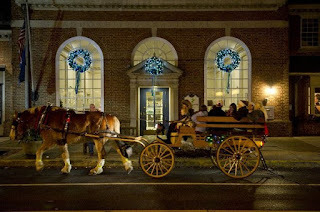 I just needed to get passed it to get to my destination...a small town main street dressed in its holiday best. 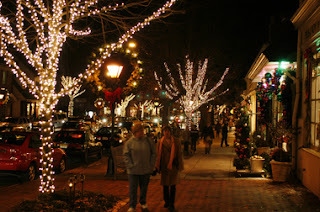 Haddonfield, New Jersey, similar, I'm sure, to so many great old towns, has a wonderful main street that this time of year, shimmers with white lights, red and gold ribbons, and frequent greenery in every store. 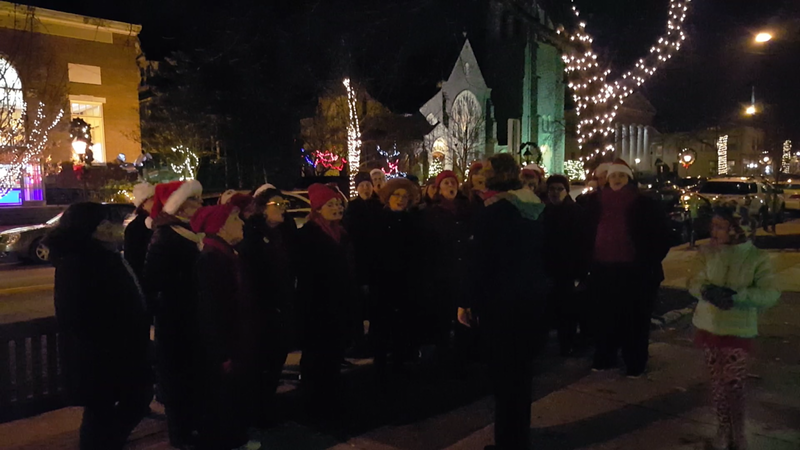 On each Friday night between Thanksgiving and Christmas, carolers are found on every corner and horse drawn carriages carry happy shoppers up and down the street under red and green blankets. Norman Rockwell would be proud. Not a snow flake in sight but the kids were singing "Jingle Bells"
I had accompanied a friend who was on a mission. She was a little behind in her shopping and determined to get it done! I, on the other hand, was just looking for a few stocking stuffers and was totally enjoying ambling around the festively decorated shops. And, as it so often the case with shopping in small, independent stores, I found things I never would have found in the mall! Shop owners and staff were all dressed in holiday sweaters or antlers (or both) willing to help with suggestions and selections. Maybe this impressed me because earlier in the day I was in a large department store and couldn't even find sales help at the registers! Actually, it was lovely talking to store owners who were just so glad you stopped in! I actually had a sales clerk who asked me to describe who I was shopping for, what my budget was, and then pointed me to the perfect find! I was thrilled walking out with my little bag in hand! Coming back to this store when I'm shopping for myself! On the East Coast, this December has been the warmest on record. Most days a winter coat is not even needed. As I spoke to a local shop owner, she explained how this has been a blessing. 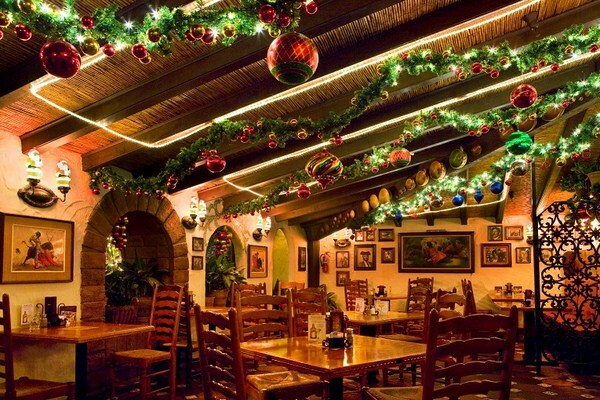 "The holiday season can make up to one-third and sometimes two thirds of our annual budget. A cold, or snowy month can be a disaster." This year, however, main street shoppers are finding it very comfortable to meander and browse. Mother nature has been merciful to those with so much at stake. Small business owners are also grateful to townships who roll out holiday carpets to attract shoppers. 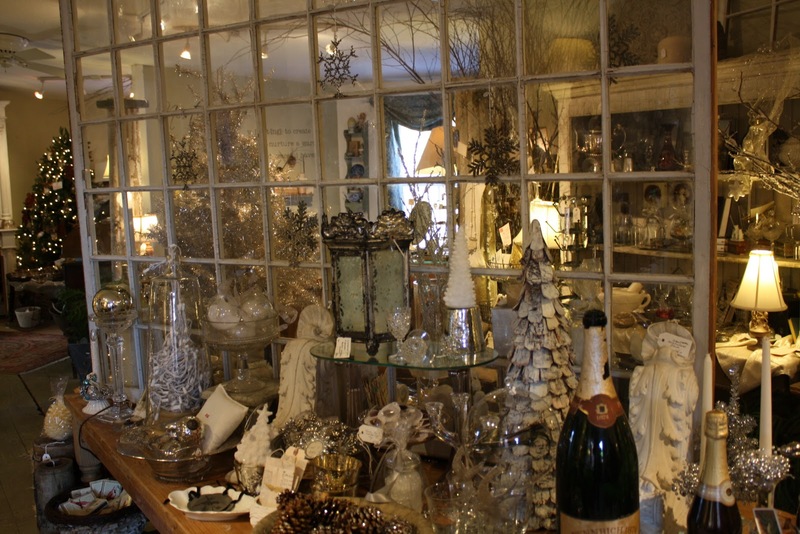 "This time of year is truly a make or break deal for most of us, " she continued, "for the owners of small shops, it can decide whether or not you will make it into the new year." That is a difficult reality. Plus, a little fact checking into the plight of small business owners, found that houses surrounding prosperous town centers have values that increase annually. That is certainly the case in this small town where large Victorian and stately homes are pricey pieces of real estate. The taxes paid by businesses that populate small towns are essential to local economies. Take a look at a down town main street that has closed shops and boarded up windows and you will find the surrounding neighborhood in despair. 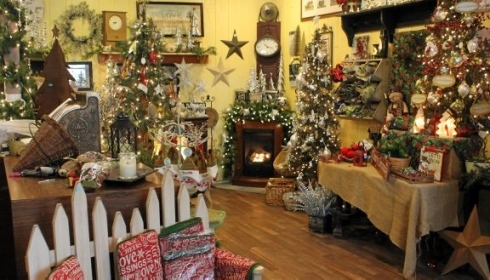 My favorite shop anytime of year! 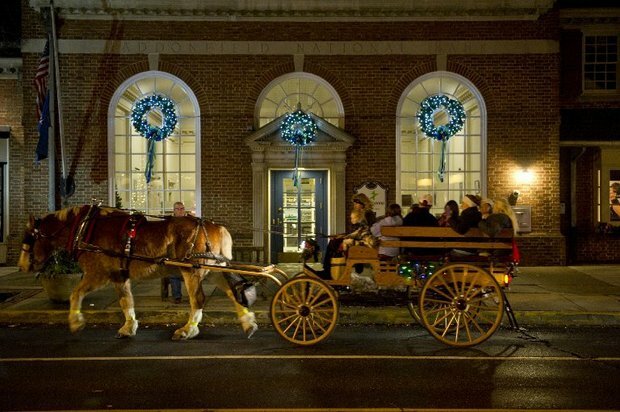 It is why towns like Haddonfield, neighboring Collingswood and so many townships across the nation, work so hard at the holiday season to attract those longing for a time when Christmas meant noses pressed against store windows, carolers on street corners and grateful shop owners so willing to help. It still exist. You just have to make a promise to pass the mall and find it. There are six days left until Christmas day. Plenty of time to support our local small business owners. Plenty of time to support our community which depends on all of us for its' survival. One purchase from each of us could make all the difference. Food Court? Not when small town restaurants look like this in December! Quick Amazing Holiday Appetizer...AMAZING I SAY! and absolutely delicious, this is the recipe you need. I did not create it but I will now certainly move it to the front of the recipe bin! Actually, I first saw it in a magazine a couple of years ago, clipped and filed it as a possibility, and then forgot about. Don't make that mistake. 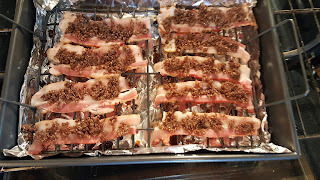 Last year, when I wanted to make an appetizer to take to my son's in-laws on Christmas, I pulled out this recipe and the "let's do this" gene kicked in! I'm so glad it did. Since I was the only "non-relative" in attendance, I felt I needed to kick it up a notch over the standard spinach dip or cheese tray. I was relieved to see it disappeared quickly. According to one young man, it was as "addictive as bacon crack". I'll take that as a compliment! This year, I made it for my annual soup night, and again, it was the first app to disappear! So many people have texted me for recipe that I thought this was the easy way to go. 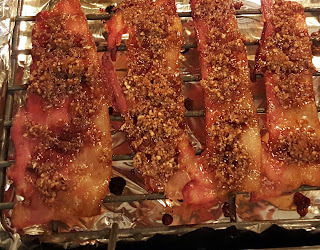 First, credit here goes to Ina Garten, the creator of this tasty "Caramelized Bacon" appetizer/candy/sweet and savory blend, with bacon, brown sugar, pecans, pure maple syrup and a surprise touch of heat! There is absolutely no describing the scent that wafts through the house as this is baking in the oven. There is drool, but no words! Combine the brown sugar and pecans in a food processor and process until the pecans are finely ground. Add the salt, black pepper and cayenne pepper and pulse to combine. Add the maple syrup and pulse again to moisten the crumbs. 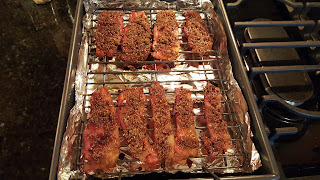 Cut each bacon slice in half crosswise and line up the pieces on the baking rack without touching. 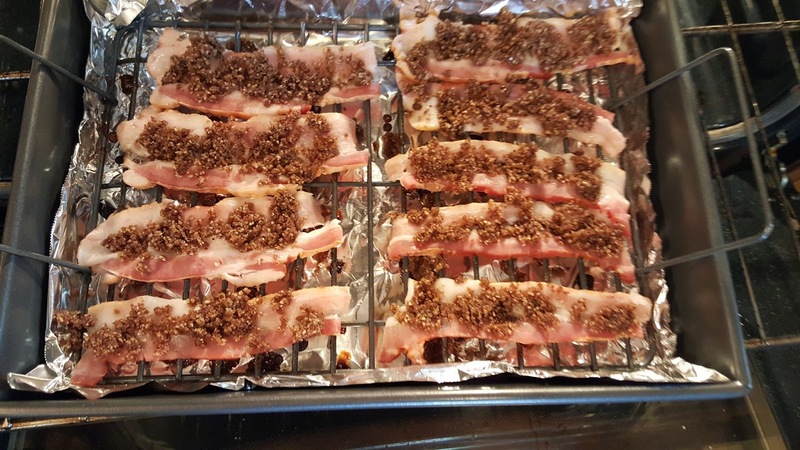 With a small spoon, evenly spread the pecan mixture on top of each piece of bacon, using all of the mixture. Bake for 25 to 30 minutes, until the topping is very browned but not burnt. If it's under baked, the bacon won't crisp as it cools. Note: Using food processor is a must with this recipe. I used a mini chopper and it worked great! 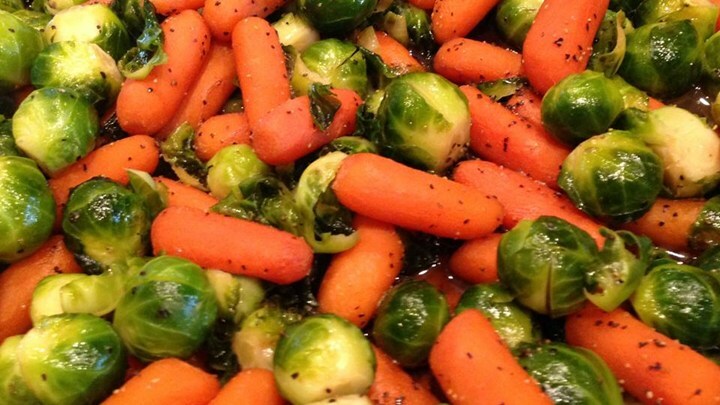 Holiday entertaining doesn't need to be stressful. Make things that can be made earlier in the day and then fill your house with warm, frequent aromas that welcome everyone coming in the door. As my dear old friend Louise used to say when she came into a pot cooking on the stove, "somebody's home!" Be the person who is home! Merry Christmas! Bride & Groom, Ocean & Beach...Perfect! Standing in the sand of Corolla, North Carolina, with my son Kyle and his fiancee, Melissa, I realized that while we may stake our claim to the beach, the ocean rolls in and takes a little of it back with each retrieving wave. It's a battle we'll always fight but never win. That said...some things are worth the battle. The beach is definitely one of them! 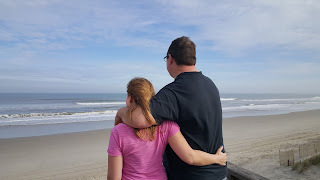 Which is why shortly after Thanksgiving the three of us trekked to the Outer Banks to plan the October 2016 wedding of this great couple. We met with the wedding planner, a dynamo Sarah Palin look-alike, a BBQ caterer, that simply knocked our socks off and Jay, a lovely man who is also a non-denominational minister. I profess to being an innocent bystander. They asked me to go so I could provide a third opinion, better described as a tie breaker. However, I must admit that these two had it together when it came to making decisions. Currituck Lighthouse oversees the Sound surrounding the museum. 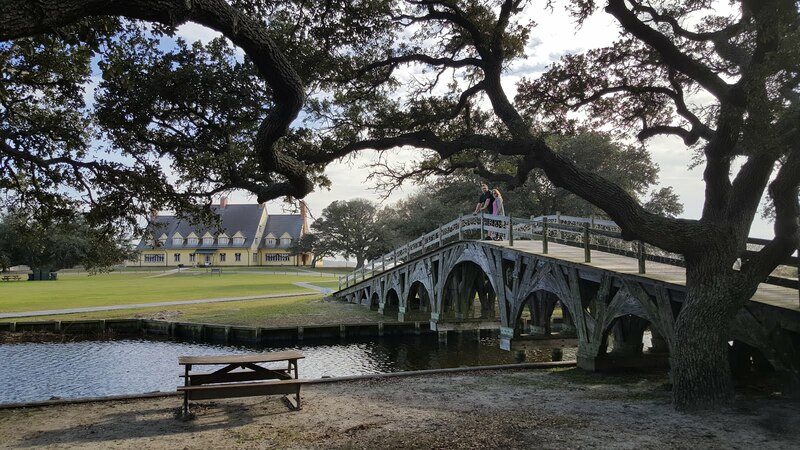 I had never been to the Outer Banks portion of North Carolina which is a strip of islands separating the ocean from bays and sounds with spectacular sunsets, tall grass-filled marshes and fields of persimmons. The natural setting that Melissa loves and the beach that Kyle can't wait to party on. It is simply beautiful! You have to know Kyle and Melissa to understand this menu. They live to enjoy life and their home is often filled with friends and family, food, wine and beer! They wanted something fun and different. So we are having a BBQ! 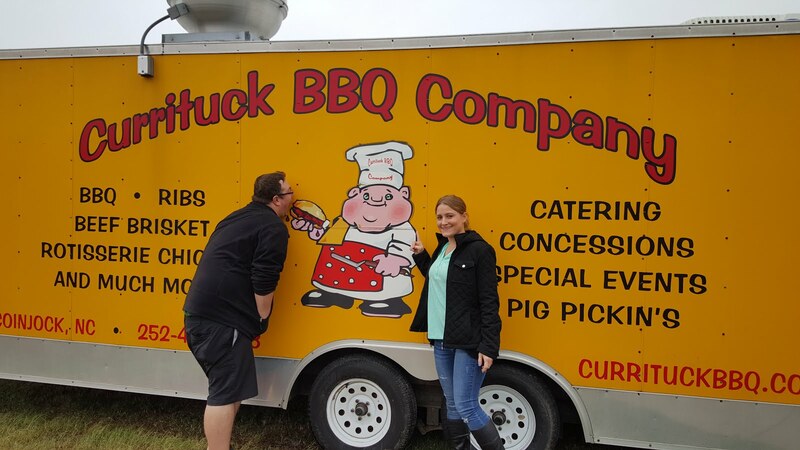 We had researched award winning "pit masters" before we traveled down. We selected two for the tastings...and then canceled the second one while we were sitting at the table of the first one. Without revealing too much of the menu, I can tell you that this was the most amazing spread of smoke meats and sides that I have ever tasted. The meats are presented without the sauce. That choice is up to individual quest. And what a choice it is! From the vinegar based "North Carolina BBQ sauce" to the heated "Texas Pete", there is a large selection that quest will be encouraged to indulge in. The sauces are "brewed" in large boilers in secret ingredients that are not made available to the general public. And if BBQ sauces are not your thing, I can assure you that the brisket, like a tender roast beef, stands on its own! Southern sides and desserts will fill out this culinary adventure. With off-season rates, daytime temperatures in the 70's and cool nights, the North Carolina shores have become a popular wedding destination in October. All of the shops and restaurants are open till Thanksgiving weekend, with many offering discounts up to 50%. Cooler ocean temps may keep some out of the water, but beach activity if plentiful. Kite flying is a major sport down here, with several kite shops in every town. Wave runner rentals are half the price of the Jersey shore, and of course, horseback riding on the beach is plentiful! Those seeking to have fun, will find it. Until I was there, I will admit to not understanding why these two picked a location so far from home. But after spending time there, and watching the excitement between Kyle and Melissa, I got it! The budget didn't allow for a large, fancy wedding with the traditional trimmings. And (most importantly) they wanted something different in a natural setting with close family and friends around them. It will be a bit of a travel by car for most (from NJ, 6.5-7 hrs. Off season traffic keeps the time down), and by planes for others. They are totally understanding of those that can't make the trip. But for those that do, it will be worth every mile! Kyle and Melissa are ready to take this journey! Halloween Salsa Chili...no tricks here, this is a treat! In the northeast, it is going to be a chilly Halloween (which I love)! So before young trick or treaters crunch through the leaves on dark streets, it is really a good idea to fill their stomachs with something warm and healthy! In fact, it may even cut down on their desire to munch between houses! But, spending time in the kitchen is probably not something that all those planned Halloween activities, allows. With that in mind, this scary delicious salsa chili recipe is easy and quick to prepare! 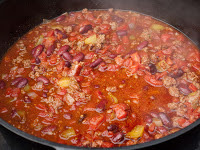 It can also be thrown together earlier in the day and put in the crock pot to simmer for hours Or, use a dutch oven type pot to prepare on the stove top. Let the mixture simmer for at least 30 minutes so they flavors can blend together. This is actually now the only chili I prepare because I love the flavor of the salsa in it. And it is so easy to control the "heat" level with the type of salsa you buy! It's going to be a busy night! Make this early and forget about it! (Which can be hard because it smells amazingly good!) Be sure to pick up a loaf of crusty bread for mopping up the sauce. Shredded cheddar cheese for topping, if desired. That’s it! Saute the garlic in a little oil, add and brown the meat. Then mix in the chili seasoning and reduce to a simmer for about 10 minutes. Drain the meat mixture and put in dutch oven (or any heavy bottomed pot) with all of the other ingredients and let simmer for at least an hour, or, if made earlier, crock pot for at least 4 hours. If you're really feeling the spirit of the holiday, serve in hallowed out pumpkin! 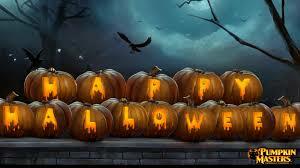 Enjoy it, then go hauntingly into the night! 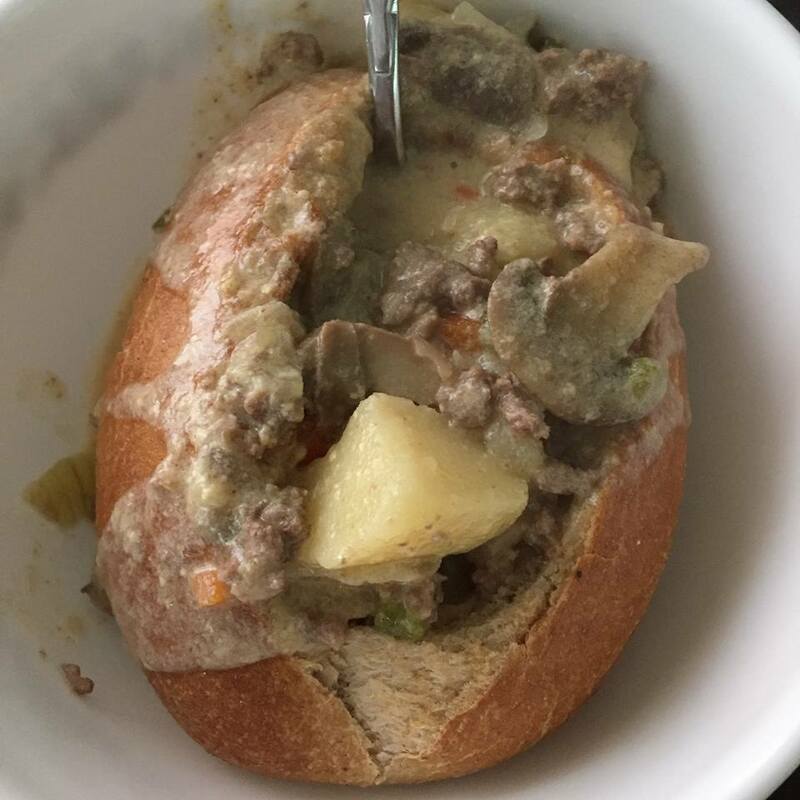 Cheeseburger Soup...And Kitchen Battles with My Sons! Don't forget about the cook!! 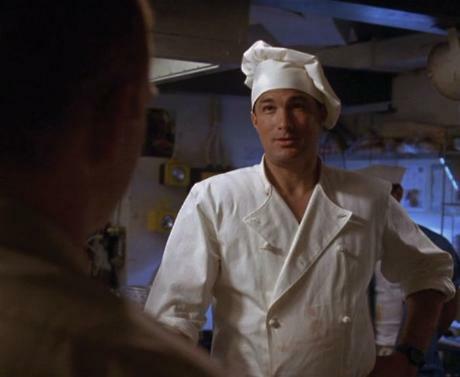 There is a scene in the Steven Segal movie "Under Siege", where the ship has been captured by the bad guys and all of its staff is held hostage...with the exception of the cook (who of course was a former Navy Seal). He manages to maneuver unseen around the ship taking out the predators one at a time. He finally comes face to face with the very scary and very bad Tommy Lee Jones and says quietly before killing him. "You forgot about the cook." My two sons loved that movie, and especially that line, even when I started using it every time they thought they were getting away with something. An example? Finding them hiding in my youngest sons closet, playing their DS Nintendo's when they were suppose to be doing outside chores, I opened the door-just a hair-and whispered in, "you forgot about the cook." They scrambled out, "Dag Mom, how did you know we were in there?" Because I was always the cook! But now, some 20 years later, there has been a mutiny, so to speak. Both my guys take over their kitchens when ever possible and seemingly "one-up" me every chance they get! I know that times have changed and that two-income households have made the kitchen gender neutral. 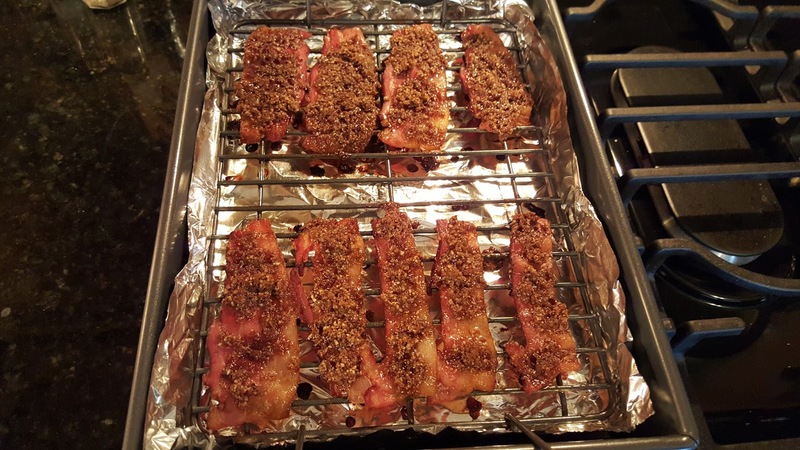 Even my nephew Scott, a single Dad and awesome cook, often swaps recipes with me. So I get it. I just never expected such competition! 1. In a Dutch oven, bring the first nine ingredients to a boil. 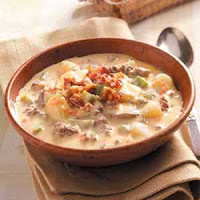 Reduce heat; cover and simmer for 10-15 minutes or until potatoes are tender. 2. Meanwhile, in a large skillet, cook beef and mushrooms in butter over medium heat until meat is no longer pink; drain. 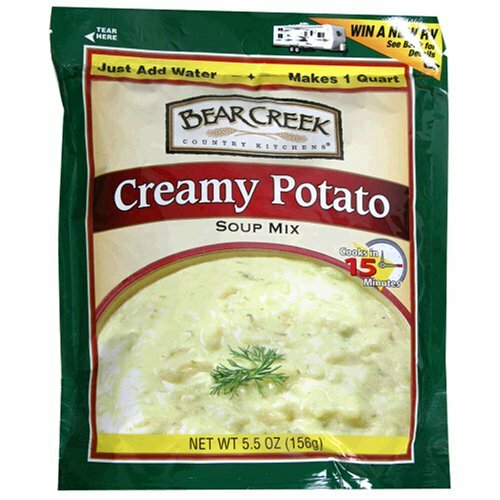 Add to soup. Stir in 4 cups milk; heat through. 3. In a small bowl, combine flour and remaining milk until smooth; gradually stir into soup. Bring to a boil; cook and stir for 2 minutes or until thickened. Reduce heat; stir in cheese until melted. Garnish with bacon. Makes about 3 qts. My son Trevor had a couple of bowls and asked me for the recipe. I obliged. He has become a really good cook and loves to make soup. He made it the very next day and this text and picture (on the left) followed: "Made bread bowls". Seriously? Where did he come up with that? And add this to the mix, a week ago, my son Kyle invited me for dinner. 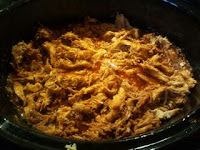 He was making slow cooked pulled turkey, a recipe I invented and perfected years ago. His was better. And he added a side of broccoli-bacon cole slaw that was delicious! It was sweet, salty and savory! Now Kyle is a culinary graduate and should be able to dazzle in the kitchen. But I'm still surprised each time he puts a spin on one of my recipes. So my boys have become the cooks now. Since I love hosting family dinners, I'd better step up my game. Their culinary conquests have set down a challenge. But no worries, I'll never let them forget about the cook! Although, I topped my family dinner with a Salted Caramel Buttercream iced chocolate cake! Trevor, Kyle and Scott..how are you on desserts??? 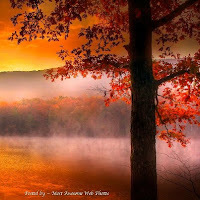 Well, with all due respect to Ms. Walker, if the world is asking us to take notice, blazing bright against the hues of autumn, it is the color orange that pleases me back, front and upside down. And it reigns in the month of October! 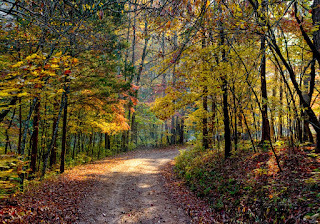 Driving down a tree-lined street, as the amber, gold and red leaves extend on branches and wash over my car in an orange reflection, I always whisper a prayer of gratitude as natures serves as witness to this wondrous creation. I notice. In the early morning, when the damp mist from an earth still warm from summer, rises over a field to meet the crisp autumnal air, it's hard not to notice. When it comes to capturing our attention, I don't think God has a thing to worry about. The orange of October even has its own scent. Several actually. 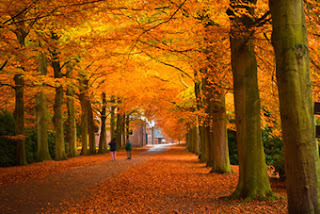 Burning leaves, pumpkin spices, cinnamon, nutmeg, ginger and anything cooking in the kitchen on crisp autumn days. 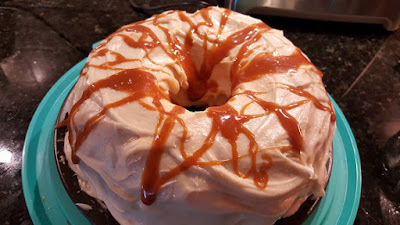 As a matter of fact, in keeping with the colors, the scents and taste of October, here is a great recipe I always make around Halloween. Because it has prunes in it, I had to give it a really cool name to get my family to try it initially, but once they did, it was a smash hit! By the way, after adding the hot sauce, it turns orange! Season the chicken with salt and pepper. Add the flour to a pie plate and season with salt and pepper, paprika, and cayenne, whisking to incorporate. Dredge the chicken through the flour, shaking off the excess. Heat a large skillet with the vegetable oil over medium-high heat. Add the chicken skin side (meaty side) down and sear until golden brown and crisp, about 3 minutes, Flip and continue cooking the other side for 3 more minutes. Remove to a platter and set aside. Add the white wine to the skillet and scrape the browned bits from the bottom of the pan. Add the chicken stock, orange juice and zest and the hot sauce. Add the red pepper flakes and whisk in the hot sauce and mustard. 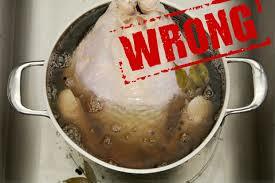 Bring to a simmer and add the chicken and the juices that are left in the platter. Top with the prunes. Reduce the heat to low and cover tightly with a lid. Let the chicken braise for 40 minutes. Uncover the chicken and remove to a serving platter. Turn the heat to high and let the sauce reduce for 2 to 3 minutes. 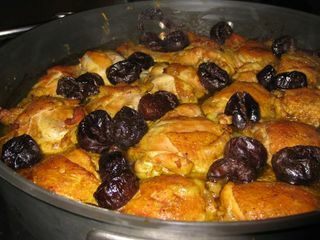 Once thickened, taste for seasoning, and pour the sauce and prunes over the chicken. Serve immediately. One more reason to love October is that it is the start of the gathering season. A time when family and friends come back indoors to huddle around the table. And if that isn't reason enough to love this time of year, I have one more item on my list that excites me more than words can say! Having been married for 39 years and divorced for only two, I'm not sure if the date the marks the thud of a judges gavel, should be acknowledged like the date that marks the sound of wedding bells. I'm pretty sure it shouldn't. Either way, both dates cast a shadow on my calendar. 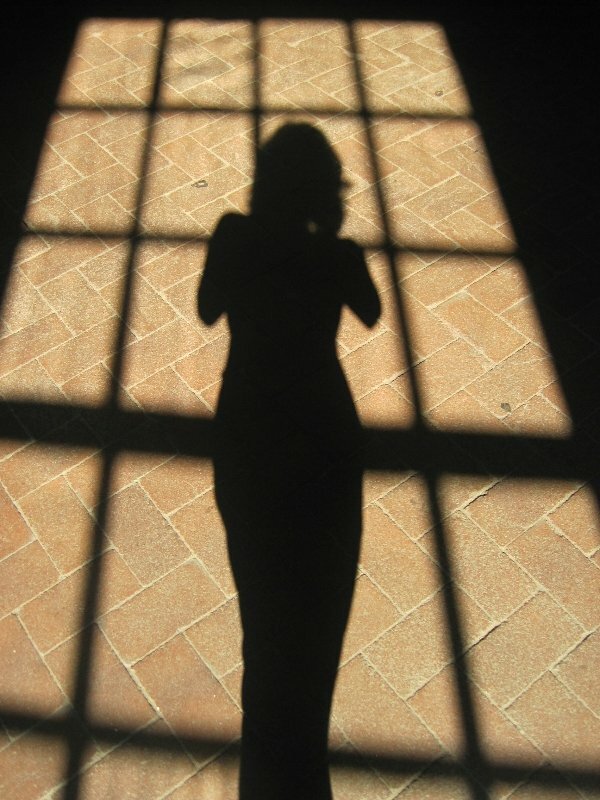 Two full years into a life gone solo, I have learned so many things about myself. I don't wish anyone the pain of a divorce, but I hope everyone gets a chance to understand the "me" in their selves and not just the "us". I believe now that in the end, it would actually make a better coupling, a better "us". If I can get passed the hesitation of offering up my heart again, I will definitely remember this. Admittedly, when I was married, I wanted to be Olivia Walton, making applesauce cake when company was coming. And then, defer all difficult situations to my husband, John, who would look at me and say "I'll take care of it Liv." So it's rather surprising that my marriage lasted three times longer than that show. But what is even more astonishing to me is that I had, within, the ability to handle the hard stuff the whole time. Just never felt the need to own it. I don't feel that way anymore. Am I tougher? No. My heart is always firmly on my sleeve. Stronger would be a better word. Like a piling beneath the bridge, I can handle the weight...so far. During the weekend of the second anniversary of my divorce, Pope Frances was visiting Philadelphia, just 15 minutes from my home. Now, I'm a Methodist by baptism, and not a very good one at that. I am, however, a believer. I have prayed more in the past two years than I have my whole life. As I watched hundreds of thousands of pilgrims make the journey to see this man, I felt solidarity. I may be alone in my prayers, but not in my beliefs. In my heart I knew that, but it was sure good to see. Maybe that is what church is for. A celebration of common faith. So, two years in and I'm not only standing, I'm still moving! For the first time ever, I purchased a car! I know women do this everyday, but it was my first time. When the transmission on my large SUV started racing, I started researching! In the end, I downsized my car, my payment and my gas mileage. And then refused to sign the paperwork until the dealer offered an extended 5 year bumper to bumper warranty. Not too shabby! I've become my own accountant, handyman (um..handywoman) and care taker. I'm also a slimmer version of myself. Not thin, by any means, but I eat healthier than I ever have. Egg white omelet with spinach and goat cheese is usually dinner once a week. Or, grilled chicken and a salad work too! 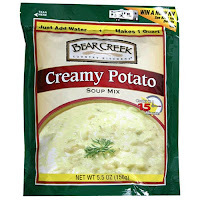 I seldom cook a starch...potatoes, pasta, rice, items used to fill the three males in my former life. (If truth me told, after a long day, a bowl of cereal can be dinner.) Plus, I prefer to save my carb consumption for really great bread - anytime! Cooking is different now. Not bad, just different. And, when I feel the need to open up the kitchen a little, I arrange a family Sunday dinner! Family has always been, and remains, my catapult to a life well lived. And now, a grandson who actually makes my heart beat faster with each step I take toward him, is the realization that all of those silent prayers have been answered. The love surrounding me as grandmother, a mom, a mother in-law, a sister, and aunt, is more than enough. If there is a scar left from the dissolve of a 40-year marriage, it is my inability to trust. I stumble every time in this area. Sometimes in the darkness of the night, I think back on all the signs I missed, and think, "what an idiot I was." The inability to trust someone new in my life hangs around my neck. Until I can break free of this albatross, I can't bring it into a new relationship. If time truly heals all wounds, this one needs a little more time. And, until that time comes...I must admit to enjoying the "me" I've become. There is a Definite Change in the Air...And I'm ready!! cool autumn breeze blowing across your sheets. 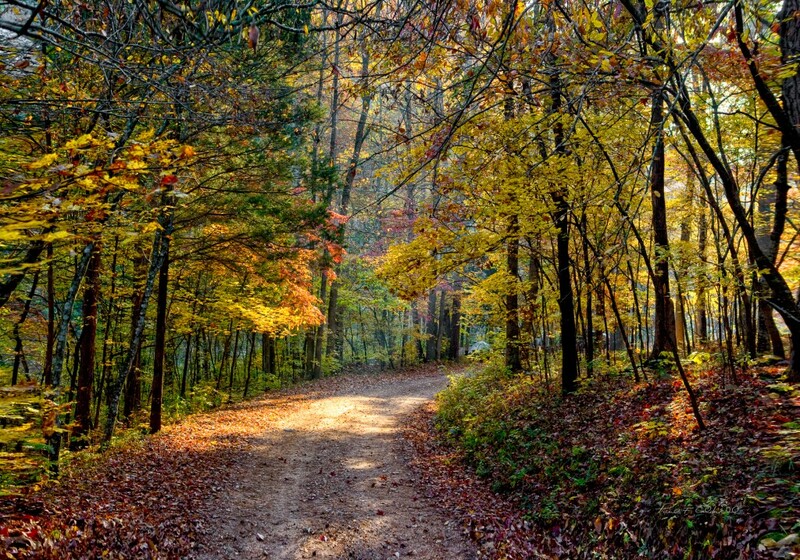 It's late September, the first noticeable sign of fall is not the changing of the leaves. That comes later. And even though you know it's coming, watching the shadows grow longer at four o'clock, and the street lights come on by seven at night, is always a reality check. Now, the days will only get shorter. But I'm okay with that. The transformation from summer to fall may seen subtle, but its most famous icon, the pumpkin, started making its appearance with the back to school ads in August! I actually tried to avoid looking at farm stands loaded with pumpkins and mums on my way to the shore on Labor Day weekend. It was my only summer vacation and I was intent on riding it to the end! Pumpkin, or at least its flavor, has become the "now" product. Starbucks, Dunkin Donuts, McDonald's and WaWa all rushed in the end of August with their fall varieties of pumpkin coffees. When I was younger (no remarks required here) there were two versions of anything pumpkin...pie and carving. That was it, a Thanksgiving desert and a Jack-O-Lantern. That has changed. An office discussion, last week, is was started me thinking about the pumpkin's rise in culinary popularity. Admittedly, this antioxidant rich fruit is loaded with beta carotene which kind of converts to vitamin A in the body. And in the conversion to vitamin A, beta carotene performs many, many important functions to our overall health. Probably none of which are found in the coffee versions. 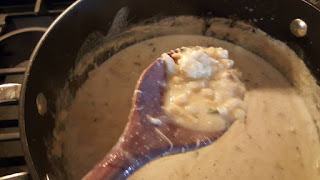 · 1/4 cup creamy peanut butter (this can be left out if there are allergy issues, but initially hesitant, I found it really added a unique flavor). Heat the canola oil in a large saucepan. Add the chicken, onion, red pepper and garlic. Saute until the onions are translucent and soft. Set aside. Combine 1 1/2 cups chicken broth, diced tomatoes, salt and paprika in a stock pot and bring to a boil. Add the pumpkin and green beans. Add saute of chicken, onions, red pepper and garlic. Reduce heat and allow to simmer for 12 to 15 minutes. 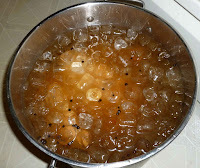 While the stew is simmering prepare the thickening agent. Gradually add 2 tablespoons of cornstarch to 1/2 cup chicken broth. Mix in the peanut butter. 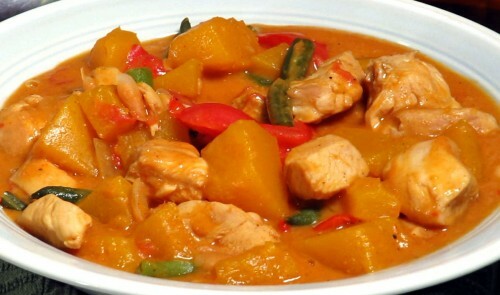 After the stew has simmered and the pumpkin is fork-tender, stir in the thickening agent. Cover with a lid and let is idle for a few minutes. In the coming months there will be many other recipes that celebrate the harvest, but I really wanted to start out with a rather unique celebration of this autumnal favorite..the pumpkin. And since, in my research, I found beta carotene offers protection from some degenerative aspects of aging, I may be working it into many recipes! !